Bob and Gaby quickly got the shocking answer and he used the hammer to peg down his tee into the hard kind-of-frozen ground. But you have to give it to him, that guy was really friendly as he immediately offered to share his gentle tool. After the hammer, the tool belt followed to remain comfortable…To stay warm or get warmer if you prefer…a little pick-me-up was also close at hand. These guys really thought of everything! In the end, they were extremely lucky because the ice only cracked but never completely broke under their weight. Fortunately, they didn’t think of using their hammer to dig out balls out of the ice. There’s not much mentioned about using a hammer in the rule book, probably because it’s not even considered a possibility. But after some quite extensive research, it appears that using a hammer to peg down a tee is permitted. In fact, a hammer may even be used to shape the surface of the teeing ground before teeing off. Some players stomp down their foot to make a depression behind their ball before their tee shot and a tool like a hammer could be used in the same manner. 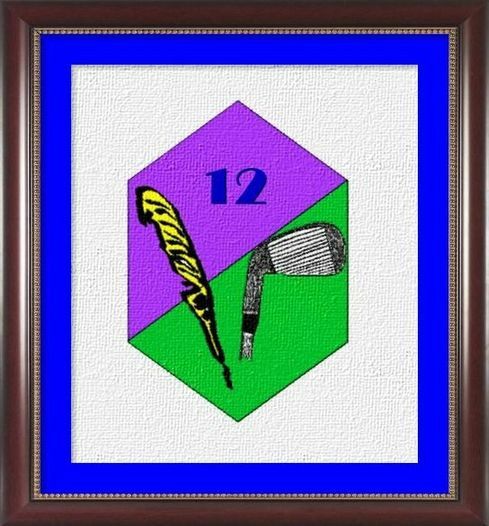 In the process, just make sure to respect golf etiquette, those sacred unwritten rules of conduct observed among respectable golfers. Among other things, golf etiquette would suggest properly maintaining the course and being mindful of fellow golfers. So in this situation, you should repair the damage the hammer made after your shot and be careful not to make too much noise with the hammer when other golfers are executing their shot. 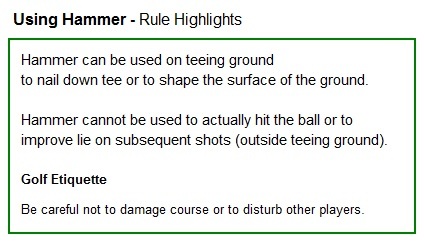 The rules are pretty clear that the hammer cannot be used to hit the ball or to alter any equipment (like golf clubs or balls) during the round. It also cannot be used as an alignment tool (for example by putting hammer down behind or in front of the ball during the shot). It can be noted that the legal use of the hammer seems to be limited to the teeing ground. As on the rest of the course, the hammer may not improve the lie around the ball for instance by stomping down grass, ground or by knocking leaves, branches or trees out of the way. When a player is putting a ball into play from the teeing ground, it must be played from within the teeing ground and from the surface of the ground or from a conforming tee (see Appendix IV) in or on the surface of the ground. 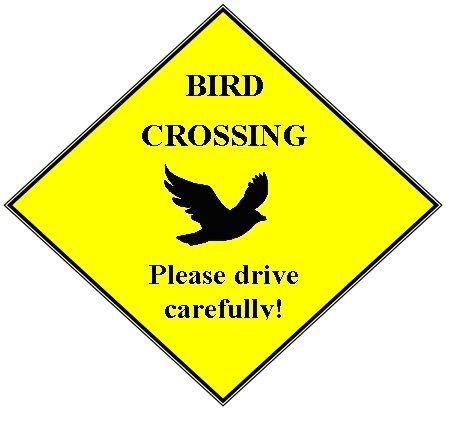 For the purposes of this Rule, the surface of the ground includes an irregularity of surface (whether or not created by the player) and sand or other natural substance (whether or not placed by the player). Although it may be ill-advised, walking on frozen water hazard is permitted by the rules. A ball lying on or in the ice of a frozen water hazard would be considered in the hazard as its boundaries expand upwards. 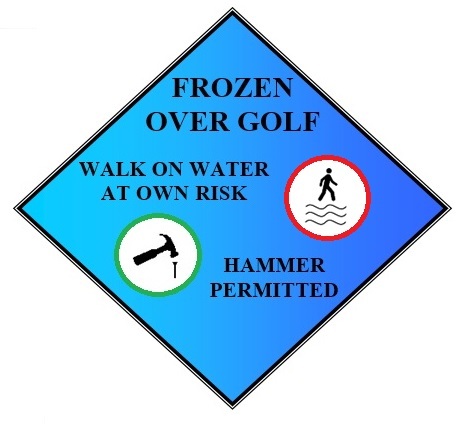 The player can get relief from a frozen water hazard using normal water hazard drop options and would incur a penalty of one stroke (Rule 26). 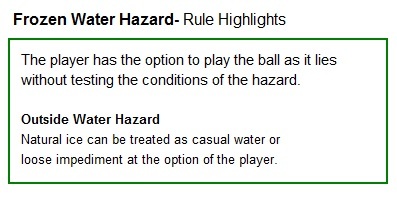 The player also has the option to play the ball as it lies in the hazard but must be careful not to test the conditions of the hazard for instance by touching the water/ice with his hand or club. Outside water hazard, the player can choose to treat natural ice as casual water or loose impediment. The casual water option would entitle him free relief. As loose impediment, ice can be removed but if the ball moves as a result of that action, the player would be accessed a one-stroke penalty and the ball would have to be replaced. Canadian golfers often experience harsh winter-like conditions to start and end their golf season. To be fair and still have fun, we suggest adopting more flexible rules in those difficult conditions. For instance, if you lose a ball in the leaves or woods, you could forget the «stroke» part of stroke-and- distance. Searching for all those balls would only result in frustrating slow play for everyone anyway. So, next time you play golf in the cold, have fun with your hammer and make sure you are extra careful when you venture onto that probably-too-thin iced pond.